Actively manage direct sunlight. The automated shading system continuously monitors for the presence of direct sunlight in the interior. 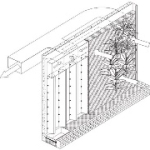 It takes into account window elevation, solar geometry, orientation, structural elements etc. 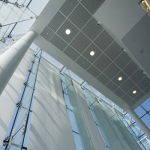 The system then adjusts the shade position to manage the distance that any direct sunlight can enter a space. Differentiate between clear and cloudy days. 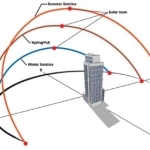 Specialized scientific solar radiometers are mounted on the roof and monitor real-time sky conditions, enabling the system to determine if it is clear or cloudy. Recognizes overcast, but bright. Sometimes it is overcast, but bright. General brightness of the sky could create glare in the workspace. 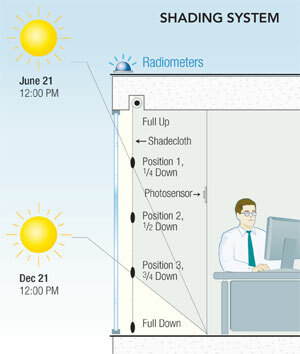 A photo sensor placed near working level by a window detects the amount of daylight that is streaming through the window and onto the work plane and the system automatically adjusts the shade. Compensates for shadow. If a window is in shadow, there is no immediate threat of glare-causing sunlight streaming in through it, even if the day is one of the brightest and sunniest of the season. The system raises the shade, so that occupants can enjoy glare-free views. 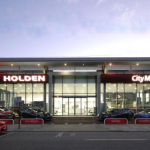 This systems can save up to 40% of energy used for lights & air conditioning and are also ideal for high ceiling showrooms with large glazing areas of shop fronts to avoid glare in the showroom.